There were only five games on the schedule Sunday, with the matchup between the Lakers and Sixers kicking things off. But the best game on the slate would not be played until late, as the Heat gave Golden State everything it wanted and then some in Oakland. That’s where Sunday’s recap will begin, with the column taking a look at the performances put forth by standouts such as Kevin Durant, Josh Richardson, Joel Embiid and Marvin Bagley III. You can follow Raphielle on Twitter here. The Miami Heat entered Sunday’s matchup with Golden State three games under .500, with the team’s play at home (11-16 record) being the primary reason for the subpar record. Erik Spoelstra’s team has been better on the road than at home, so in that regard the fact that they had a chance to beat the Warriors late does not come as a surprise. The Heat had the final shot, but Dion Waiters’ three-point attempt missed the mark and the Warriors took the win by a final score of 120-118. Kevin Durant led all scorers with 39 points (16-of-24 FGs, 6-of-10 FTs) to go along with six rebounds, four assists, one blocked shot and one three-pointer, and he would have been well into the forties if not for his 1-of-7 night from three. Over the last five games Durant’s shooting 58.8% from the field, but the three-point shooting has been a bit of an issue. During this stretch he’s making just 25.0% of his attempts from three, and over his last ten games Durant is a combined 12-of-46 (26.1%). A 38.3% career three-point shooter, Durant is making just over 37% of his attempts in 2018-19. Over the last month he’s been a top-20 player in nine category leagues, which is nothing to complain about, but he’d be ranked a bit higher if the three-point percentage was closer to his number for the season as a whole. The Warriors had just three double-digit scorers Sunday, with Klay Thompson adding 29 points and Stephen Curry 25. With regard to Curry, he shot 9-of-18 from the field and 5-of-10 from three, and he also accounted for four rebounds, two assists and two steals. Those are good numbers, but the figures mask the fact that he once again struggled in the first quarter. Over his last four Curry has shot a combined 1-of-14 from the field in the first quarter according to Anthony Slater of The Athletic. Like Durant and his recent three-point shooting, this is by no means a “deal breaker” when it comes to Curry’s fantasy value. But it is an interesting recent trend to keep an eye on as the Warriors approach the All-Star break. The aforementioned Durant was one of two players in Sunday’s game to score at least 30 points, and the other player managed to do something that he had never done in his career. Heat guard Josh Richardson established new career-highs in both points (37) and three-pointers (eight), shooting 14-of-22 from the field (8-of-11 FTs) while also accounting for five assists, one rebound and one steal in 37 minutes of play. This was the second time this season that he scored 30 points or more in a game, with the first being his 31-point effort in an October 29 loss to the Kings. Over his last five Richardson is averaging 21.6 points, 3.4 assists, 2.6 rebounds and 1.0 steals per with shooting splits of 54.9/53.8/88.9. On the season he’s shooting just 40.9% from the field and 37.3% from three, so it’s safe to say that Richardson is in good form when it comes to his work on the offensive end of the floor. 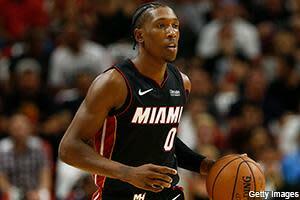 The question to ask regarding Richardson is what will he do for an encore, as the Heat visit Denver Monday night. He’s played in the second game of a back-to-back five times this season, averaging 19.2 points, 4.2 rebounds, 4.0 assists and 1.0 assists per game while shooting 40.6% from the field and 42.3% from three in those outings. Richardson, who did not get the final shot as he lost his balance and fell out of bounds, was one of three Heat starters to score at least 22 points on the night. Waiters shot 9-of-19 from the field and finished with 24 points, four assists, three rebounds, one steal, one blocked shot and six 3-pointers, establishing season highs in both points and made three-pointers. And Justise Winslow tallied 22 points (8-of-16 FGs, 2-of-2 FTs), six rebounds, four assists, one steal and four 3-pointers. Winslow, who scored a total of 22 points in the three games prior, last surpassed the 20-point mark in a January 25 win over the Cavaliers (27 points). The three players Philadelphia acquired in its trade with the LA Clippers all made their 76ers debuts in Friday’s win over the Nuggets, with Tobias Harris going for 14 points, eight rebounds and three assists and Mike Scott and Boban Marjanovic combining for six points, two rebounds, one assist and one blocked shot. And that was also a game in which Joel Embiid struggled, as he scored 15 points but did so on 4-of-17 shooting. Both Embiid (who was dealing with an illness Friday) and Harris were better in Sunday’s win over the Lakers, as they combined to score 59 of the 76ers’ 143 points. Embiid led the way with 37, shooting 12-of-16 from the field and 11-of-12 from the foul line, to go along with 14 rebounds, three assists, one steal and two 3-pointers. The double-double is Embiid’s 46th of the season and his eighth in as many appearances. And over his last five games the 7-footer is averaging 28.8 points, 15.2 rebounds, 2.6 assists, 2.2 blocks and 1.2 steals per, and he hasn’t even shot the ball well during this stretch. Embiid is shooting 42.6% from the field and 20.0% from three over the last five, with the free throw line (88.3% shooting on 12.0 attempts per game) being an area in which he’s performed well. Harris scored 22 points Sunday, making 9-of-14 shots from the field, while also accounting for six rebounds, six assists, one blocked shot and three 3-pointers in 29 minutes. Shooting 49.8% from the field, 44.0% from three and 87.3% from the foul line on the season, the 6-foot-9 forward gives Philadelphia another quality shooter to call upon. His presence in the first unit helps open up driving lanes for Ben Simmons and Jimmy Butler, which is especially key for Simmons given his well-documented issues when it comes to perimeter shooting. Butler finished Sunday’s game with 15 points, four rebounds and three assists, and JJ Redick tallied 21 points with five assists, two rebounds, two steals and three 3-pointers. Lastly both Marjanovic and T.J. McConnell reached double figures, as the former played 13 minutes and finished with ten points and the latter made all six of his field goal attempts and tallied 13 points, three assists and three steals in 19 minutes. Kings rookie forward Marvin Bagley III put together the highest-scoring month of his young career in January, averaging 13.4 points per game while shooting 48.8% from the field. The second overall pick in the 2018 NBA Draft also averaged 7.7 rebounds per game last month, and through his first three games in February he appeared poised to improve on those number. But after averaging 16.0 points, 11.7 rebounds, 2.0 assists and 1.7 blocks per game in those three outings, Bagley was limited to three points (1-of-6 FGs), seven rebounds and one steal in 20 minutes Friday vs. the Heat. With the Suns visiting Sacramento Sunday, Bagley had a good matchup given Phoenix’s defensive struggles. And he bounced back in a big way, scoring a career-high 32 points (10-of-15 FGs, 11-of-13 FTs) to go along with seven rebounds, one assist, one blocked shot, one steal and one three-pointer in Sacramento’s 117-104 victory. The ten field goals made matched a career-high (this was the third time in the last month that he’s made ten in a game), and this was also the first game in Bagley’s short career in which he’s reached double digits in made free throws (previous high: nine). Even with the aforementioned three-point performance the 6-foot-11 forward boasts averages of 16.2 points, 9.6 rebounds, 1.4 assists and 1.2 blocks per game over his last five outings, and he’s shooting 48.5% from the field and 83.3% from the foul line during this stretch. Bagley isn’t much of a threat from beyond the arc, but he’s certainly skilled enough to find quality looks from the mid-range and in. Over the last two weeks he’s been a top-80 player in nine-category leagues, which isn’t bad for a rookie who’s outside of the top-150 for the entire season. Five other Kings scored in double figures Sunday, including guards Buddy Hield (18 points, six rebounds, one steal, one blocked shot and three 3-pointers) and De’Aaron Fox (17 points, nine assists, six rebounds, two steals and two 3-pointers). Nemanja Bjelica (ten points, eight rebounds, three blocks, two assists, one steal) and Willie Cauley-Stein (ten points, eight rebounds, five blocks, two assists and one steal) combined to block eight shots, with Cauley-Stein establishing a new season-high. The last time he blocked five shots or more in a game prior to Sunday’s effort: January 23, 2018 vs. Orlando. Sunday’s matchup with Philadelphia was not only the penultimate game of the Lakers’ annual Grammys road trip, but also the first game for new addition Reggie Bullock. Bullock, acquired in a trade with the Pistons, was picked up due to the fact that the Lakers needed more consistent shooters around LeBron James (most people saw this as an issue that needed to be addressed during free agency last summer, but that’s a topic for another day). That would in turn open things up for LeBron James, and Luke Walton didn’t wait long to get Bullock into the swing of things. The sixth-year guard out of North Carolina was inserted into the starting lineup, replacing Rajon Rondo, and in 31 minutes he accounted for two points (1-of-5 FGs), three assists, two blocked shots, one rebound and one steal. To say the least this wasn’t the best debut for Bullock, but it’s understandable when considering the fact that he’s only been with the team for a couple days. Bullock’s averaging 12.1 points per game on the season and shooting nearly 39% from beyond the arc, and he doesn’t have to have the ball in his hands for lengthy periods of time in order to be effective on the offensive end of the floor. As for the Laker who played well Sunday afternoon, that would be second-year forward Kyle Kuzma. Kuzma had it going offensively throughout the loss, as he scored a game-high 39 points (14-of-21 FGs, 6-of-7 FTs) with three rebounds, one assist and five 3-pointers in 32 minutes of action. After scoring 13 points or less in each of his first three games back after missing two due to a hip injury, he’s scored a total of 64 points on 24-of-42 shooting from the field in his last two outings. Just outside of the top-100 in nine-category leagues on the season as a whole, Kuzma’s value is hurt some by the fact that he doesn’t produce a great deal in non-scoring areas outside of rebounding (5.7 rpg). And that’s been the case of the last five, as he’s averaging just 2.6 rebounds and 1.4 assists per game during this stretch. But he’s still a must-play due to the ability to put points on the board. Dallas trailed Portland by as much as 15 in the fourth quarter Sunday before coming back to win by a final score of 102-101. Dorian Finney-Smith played solid defense on Damian Lillard in the fourth quarter as Dallas mounted its rally, and Luka Doncic dropped 28 points (9-of-20 FGs, 6-of-8 FTs), nine rebounds, six assists, one blocked shot and four 3-pointers to lead the way offensively. This was Doncic’s ninth 25/5/5 game of the season, and only LeBron James has more 25/5/5 games as a teenager in NBA history. The early favorite to win Rookie of the Year, who scored 13 of his 28 in the fourth, had some help offensively as Tim Hardaway Jr. put together his best game in a Mavericks uniform. The former Knicks guard, one of four players acquired in the deal headlined by Kristaps Porzingis, shot 9-of-18 from the field and 4-of-5 from the foul line, finishing with 24 points, four rebounds, three assists and two 3-pointers. By comparison Hardaway scored a total of 24 points in his first two games with Dallas, shooting a combined 10-of-28 from the field and 3-of-12 from beyond the arc. Hardaway’s in a spot now where he has capable creators that he can play off of while also having the ability to get his own off the dribble. In New York there was more on his shoulders with regards to creating offensively, as the Knicks did not have a playmaker who’s on par with Doncic. Can he make a habit of scoring 20-plus points? That remains to be seen, but on Sunday Hardaway had the look of a player who’s in a system that can make him a more effective player. And that would in turn boost his fantasy value. Orlando made a noteworthy move at the trade deadline, as it acquired Markelle Fultz from Philadelphia in exchange for Jonathon Simmons and a first-round draft pick. The Magic franchise has been searching for its point guard of the future for quite some time now, and they’ll look to see if Fultz can eventually be the answer. When he’ll be able to play has yet to be determined, which means that veteran D.J. Augustin will carry on as the team’s starting point guard. In Sunday’s 124-108 win over Atlanta the 11th-year pro posted a double-double, his second of the season and first since October 22. Augustin finished with 14 points, ten assists, three rebounds, one steal and one three-pointer, shooting 6-of-9 from the field in the win. Having tallied five assists or more in four of Orlando’s five games this month, Augustin is averaging 9.8 points, 6.6 assists, 1.8 rebounds and 1.2 steals per game over his last five games. Augustin was one of two Orlando starters to finish Sunday’s game with a double-double, as All-Star center Nikola Vucevic accounted for 19 points, 12 rebounds and three assists. Evan Fournier and Jonathan Isaac scored 17 points apiece, with Fournier also dishing out seven assists and Isaac blocking five shots (matching a career-high). Over his last five games Isaac is averaging 13.4 points, 6.2 rebounds, 3.0 blocks and 1.6 steals per game, and he’s shooting 50.0% from the field, 33.3% from three and 90.0% from the foul line. Terrence Ross finished with an 18/6/2 stat line in 24 minutes off the bench, and Aaron Gordon accounted for 12 points, three rebounds, three assists, one block and two 3-pointers. Lastly, reserve wing Wesley Iwundu finished with ten points, seven rebounds, two assists and one blocked shot in 18 minutes. Portland was unable to hang onto its lead Sunday due in large part to going ice cold in the fourth quarter, as Terry Stotts’ team was outscored by a 24-9 margin. Dallas took away Damian Lillard, who went on a serious run during the third, and with C.J. McCollum (14 points on 6-of-17 shooting from the field, five rebounds and five assists) struggling Portland wound up taking the loss. The All-Star guard finished the game with 30 points (10-of-23 FGs, 4-of-4 FTs), five assists, three rebounds, two steals and six 3-pointers, but Lillard did much of his damage during the second half of the third quarter. He scored 21 points during this stretch, at one point making eight straight shots from the field. He’s now scored 30 points or more in 18 games this season, and over his last four he’s averaging 25.8 points, 8.8 assists, 4.0 rebounds, 2.5 steals and 2.8 three-pointers per game with shooting splits of 46.8/31.4/94.7. Having missed the two games prior due to tightness in his hamstring, Suns guard Devin Booker was back in the starting lineup for Sunday’s game against the Kings. The reigning three-point contest champion (he’ll be in Charlotte to defend his title next weekend) played 35 minutes in the loss to Sacramento, putting together a stat line of 27 points (9-of-19 FGs, 6-of-7 FTs), eight rebounds, six assists and three 3-pointers. A good effort for Booker, who picked up another knock during the third quarter as he banged knees with Kings guard Bogdan Bogdanovic. Booker left the game briefly but was able to return, as he started the fourth quarter with a sleeve on his left leg. Between Sunday’s minor injury and the prior hamstring issues, the All-Star break is coming at just the right time for the fourth-year guard. Josh Jackson and Deandre Ayton also had solid outings against the Kings, with Jackson tallying 18 points, five rebounds, three blocks, one assist and two three pointers and Ayton (16 points, nine rebounds, one blocked shot) finishing one board short of a double-double.